How much does it cost to travel to Seville? How much money will you need in Seville? €107 ($121) is the average daily price for traveling in Seville. The average price of food for one day is €30 ($34). The average price of a hotel for a couple is €90 ($102). Additional pricing is in the table below. These average travel prices have been collected from other travelers to help you plan your own travel budget. How much money do I need for Seville? The capital city of Andalucia, Seville is both the cultural and financial hub of southern Spain. It's also a popular tourist destination. The city has over 700,000 residents and 1.6 million in the metropolitan area, making it the fourth largest city in the country. It is cut in half by the Guadalquivir River, with the two halves referred to as Sevilla and Triana. 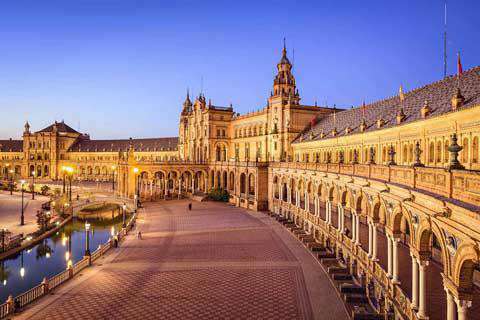 Seville has continued to grow in popularity as a tourist destination since the 19th century when it was included as a stop on the Romantic "Grand Tour" of Europe. In 1992 Seville hosted the International Exposition which led to the construction of a new airport, train station, as well as other infrastructural improvements. Today Seville remains very popular with tourists for its many festivals, interesting attractions, great restaurants and nightlife scene. Seville has a subtropical Mediterranean climate with a dry summer and wet winter. Seville has one of the hottest summers in all of continental Europe with highs in July reaching 36 degrees Celsius. Winters are usually mild with January being the coolest month. Average highs still linger around 16 degrees Celsius and lows can drop to 5 degrees Celsius. Most of the rain occurs between the months of October and April, with December being the wettest month. There are many landmarks around town in Seville, with some of the most popular including the Cathedral of Seville, La Giralda Tower, the Jewish Quarter, Real Alcazar, the Hospital de los Venerables, Torre de Oro and Parque Maria Luisa. Popular museums include Museo de Bellas Artes, Museo de Carruajes, Museo del Baile Flamenco and the Archeology Museum. The historical heart of Seville is where you will find most of the sights. This area, Centro Historico has the Seville Cathedral, some upscale hotels, and many restaurants. Barrio Santa Cruz is the former ghetto for Seville's Jews, and today it has many ornate fountains, gates and courtyards. There are some interesting churches, restaurants, and charming narrow alleyways. La Macarena is often overlooked by visitors, but it has several interesting sights such as the Convento de Santa Ines. Triana and El Arenal are both districts that were made famous by several of Spain's Golden Age writers. There is a riverside esplanade, Marques de Contadero, that runs along the banks of the river, as well as a handful of sights. There are many different things to do around Seville. Some interesting activities include flamenco dancing, attending a bull fight, and wandering through the many outdoor markets which have anything from food to clothing or furniture for sale. It's easy to fill several days, at least, in Seville. If you're looking for some good food, tapas are a favorite in Seville. These small dishes are about the size of an appetizer and are usually delicious when enjoyed with wine. You'll want to order several as they are much smaller than entree sized, but they are quite delicious and can be surprisingly filling. There are great tapas places throughout Seville, with many concentrated around the cathedral in the center of town. There are some bars near the river that have good views, but prices can be a little steep given the quality of the food. If you're on a particularly tight budget you can buy your own food at any of the markets that are around the city center. Enjoy a meal of your own making as a picnic with a view. Like most major cities in Spain, Seville's public transportation is excellent. You can travel most places by bus, which are frequent and generally efficient. Another interesting option is the service bikes available for rent around town. They're stored at docking stations and you can purchase a week long pass for five euros. With this pass you'll get a half hour free and then pay one euro for every subsequent hour. Alternatively you could also rent a scooter for a day for roughly 30 euros. There is a tram system but it is being integrated into Seville's transportation system. It runs from the San Bernardo Train Station to the Plaza Nueva and will eventually continue north and west into Triana. The metro system opened in 2009 and makes a "U" shape traveling from the southwest to the southeast through the southern end of the city. It stops at Plaza de Cuba, Prado de San Sebastian and San Bernardo. Taxis are also an option and are easily accessed throughout the city.